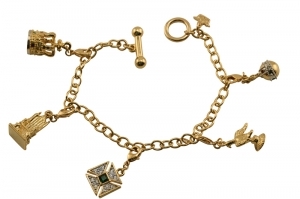 This beautiful charm bracelet holds the charms for the coronation regalia. The Coronation chair, crown, orb, ampula and top cross from the sceptre. V&A Jewellery - Bows through the ages charm Bracelet: This delightful bracelet of miniature decorative bows represents distinctive 'bow' designs through the ages and is taken from six different sources and four different centuries - an English shoe buckle and a Russian bodice ornament both dating back from 1760, a West European pendant dating from 1630-1660, a French necklace from around the same period, and a silky day dress designed in London by Victor Steibel in 1947.